When I was little, I thought that Fig Newtons were like a cruel joke. I didn’t get dessert very often, and when cookies were an option, the last variety I was looking for was a Fig Newton, they were almost as bad as Oatmeal Raison Cookies (purely because of the raisins). As you can see, there was a pattern, I was just not fond of dried fruit. In fact, I wasn’t much of a fresh fruit person either. I guess I had to counter balance the lack of sweets in my life – if I didn’t get non-healthy sweets, I wasn’t about to eat the healthy ones either. As an adult, some things have changed. I still don’t like raisins in my cookies – but figs are almost like a delicacy. 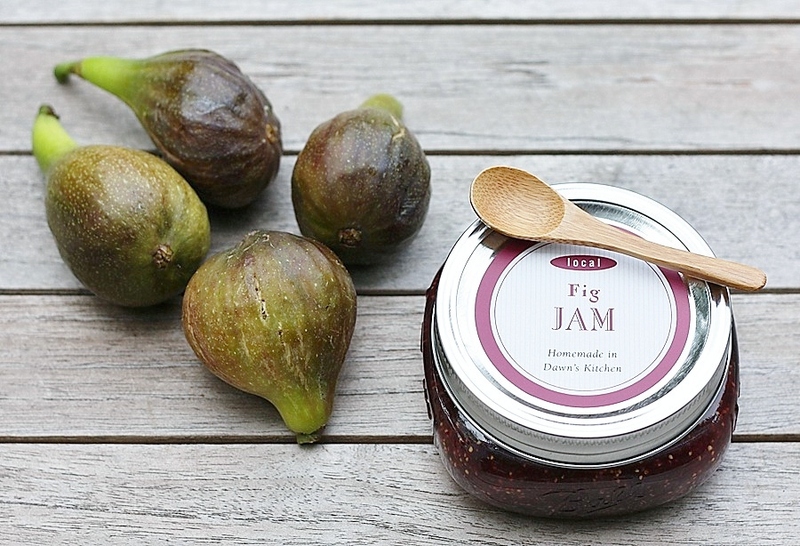 I remember the first time I had some fig jam with cheese – it was a remarkable combination. I just couldn’t believe how perfect the cheese went with the figs (but that was before I tried the truffled honey…talk about out of this world), I was actually starting to like figs. I even remember trying a Fig Newton as an adult – and wow, I loved it. Of course this was after the cheese incident, which made me appreciate figs in a whole new way. I saw a recipe in Food in Jars for Fig Jam, and I couldn’t wait to give it a try. I waited for the figs to go on sale at Whole Foods, and I bought a whole bunch. They made the most wonderful jam – I was eating it with a spoon. The next weekend, I saw my neighbor post something about his fig tree – I couldn’t believe it, more figs!!! So, what does that mean? More jam – yes, I know I have a problem, and you haven’t even seen my pantry. My next project? Turning that jam into Newtons…boy does life come full circle. Prepare a boiling water bath and 3 half-pint jars. Place the lids in a small saucepan, cover them with water, and simmer over very low heat. Combine the figs and sugar in a large pot and stir well to help the sugar pull the juice from the figs. When the mixture starts to look juicy, place the pot over high heat and bring to an active simmer. Cook for approximately 20 minutes, stirring regularly, until the figs have started to break down and the liquid starts to look syrupy. At this point you can choose to have chunky jam, or use an immersion blender to make it smoother. Add the lemon juice and liquid pectin and return the figs to an active boil for 5 minutes. Remove the pot from the heat and ladle the jam into the prepared jars. Wipe the rims, and apply the lids and rings, then process in a boiling water bath for 10 minutes. I am just writing up a post on making strawberry jam for my new blog (it will be my first real post :D)! This post is a great inspiration- you have a wonderful style of writing and choice of photos! I was interested in how your blogging career began- i’ve just started my own blog and am really interested in learning how other people on wordpress got their blog out there for other people to know about and visit! Check out my about page, it will tell you all about how I started this little hobby :). Good luck!! Love your label on the jar Dawn! So cute. :) I love fig jam. I recently got some at a winery and devoured it with cheese and pita chips. It was out of this world. I can just imagine how delicious this is. And truffled honey?! Oh wow! Thanks Kristy – yes, I can’t wait to serve this with cheese!! Fig is my favorite fruit! It must be so yummy! I was eating it with a spoon as I was filling jars!